As many of you already know, Margaret started the Workbox System this year. I read several blogs and came up with items that followed Pre-K/Kindergarten level learning. She is really enjoying herself and it affords me about 90 minutes to work with her older brothers on their lessons. I do, however, sometimes feel at a loss as to what to place in the boxes. I literally have hundreds of items and ideas categorized in a Workbox Binder. Even with this amazing binder, I started to feel a bit bored of the workbox system around the fifth or sixth week. When I was offered the eBook Preschool Activities in a Bag to review for The Schoolhouse Review Crew I felt as though my struggle had come to an end. The company Activity Bags was started by two homeschooling moms and preschool bags are intended to help occupy younger children during the school day. 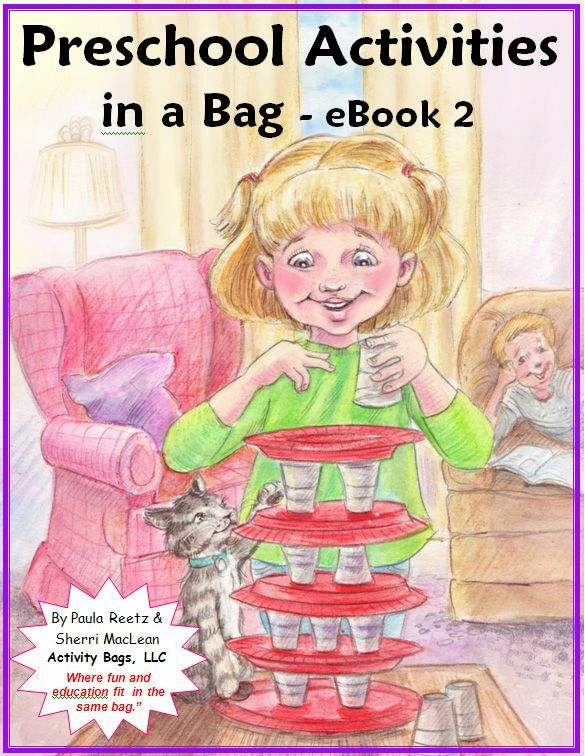 Preschool Activities in a Bag is an eBook that offers ideas for just what the title suggests: preschool activities that are contained in a single zip-type bag. 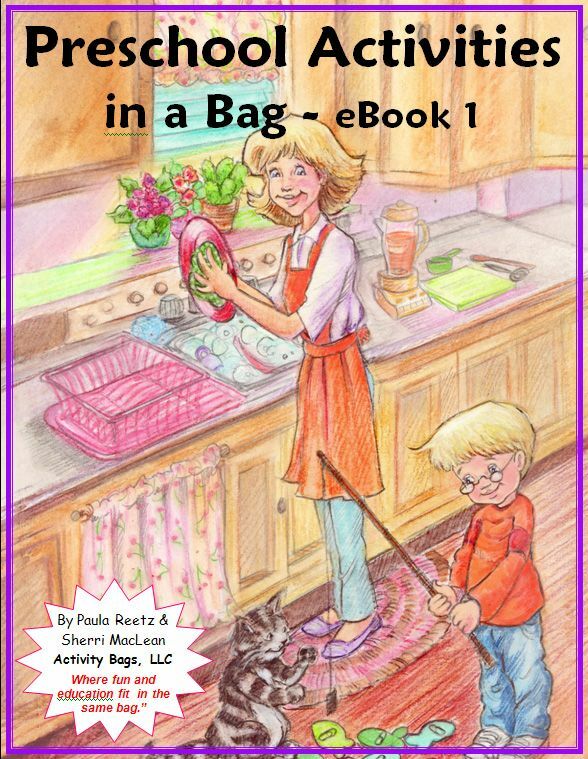 Each activity contained in these two amazing eBooks is intended for ages 3 to 6 and contain an activity description, skills developed, supply list, instructions to assemble the bag, buying tips, and a template for a label for each bag. HOW DID I USE THIS PRODUCT? The activities outlined within these bags are easy to assemble using many supplies that any homeschooling family will have on hand. They are intended to be independent activities making them a perfect fit for the workboxes. I read through the two eBooks I received and focused on creating bags that would help Margaret in areas that she is currently working: phonics and mathematics. Believe me, the books contain a lot of activities and finding this product was like a breath of fresh air. Many activities use templates which they supply (in the back of Book 1, and with the activities in Book 2). The books also contain instructions and suggestions for setting up your own bag swap with other local moms of preschoolers. Another interesting thing about the bags are the suggestions for further use. Don't have a preschooler? What about gifting these as a Big Brother/Big Sister gift when a new baby arrives? Or making some of these to use just when the babysitter comes? The books are filled with activities and ideas for their use. I like it when you put bags in my workboxes because that means my schoolwork will be fun! Preschool Activities in a Bag eBook 1 and eBook 2 are available on the Activity Bags Website for $15.00 each or as part of a bundle for $27.00. I sent both eBooks over to FedEx office to be printed and bond for about $10.00 each. They turned out beautifully, and it makes it such an easy on-hand resource. In addition to preschool level activity bags, the company offers eBooks on Science Bags, Math Bags, Reading Bags, and more. These bags range in ability level from elementary to 8th grade, so be sure to check the listing to make sure you are getting the level you desire. Other members on The Schoolhouse Review Crew used these products and blogged about them as well. Check out their reviews by clicking here or by clicking the banner below. Disclaimer: As a member of The Schoolhouse Review Crew I received Preschool Activities in a Bag eBook 1 & 2 in exchange for an honest review on this blog. I received no other compensation.